The Veritas dividing rule makes it easy to divide boards into halves, thirds, quarters, all the way up to tenths — it works on boards eight inches wide and smaller. Change the orientation and it also functions as a marking gauge. Veritas makes the rule from stainless steel and the pins from brass. The pins swivel and have a flat side for keeping the rule in the right position. Markings on the top of the pins show you when the flat sides are fully seated against the board’s edge. To divide a board, twist the rule on the board so the pin on the pointed end and one of the pins on the flat end seat against the board edges. Pick the correct hole, place a pencil into it, and run the rule the length of the board. Repeat as necessary. To use it as a marking gauge and mark lines up to four inches away from the edge, seat the two pins on the flat side of the gauge against the board edge and place your pencil into the second set of holes spaced every 1/16″. Since the pins swivel, you can also use the marking gauge for curved edges, but the scale will be slightly inaccurate. The Veritas dividing rule will run you about $30. For a lot less money – you can do the same with any ruler or tape that is longer than the width of the board. 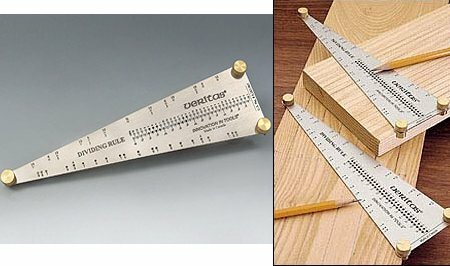 Just lay the ruler/tape at an angle across the width of the board – such that the-edge-to-edge measurement is easily divided by 2 (e.g. 14 inches for a 2×12) then mark the board at the 7 inch position. This is the center of the board. If you repeat the process at another spot along the board – you have 2 marks that can be used to pencil-in a centerline. I recently came under the impression that this is why a foot has 12 inches instead of 10. It was a lot easier to divide 12 into 1/2, 1/3rd, 1/4th. No idea if it is true or not but it sounds reasonable. Points well taken, but I am happy Veritas is still spending money in R&D. It’s unclear why it was decided that 12 inches is equal to a foot, but it dates back to the Egyptians (who the Greeks, then the Romans, and then the English inherited it from) around 3000 BC. Yeah, the concept is that old. The actual unit of length has varied widely over history though. Anyway, yes, 12 inches in a foot makes dividing into some fractions easier, at the expense of making everything else harder. Give me the metric system any day (even though I’m not used to it; I’ll learn). o man some of you people drive me nuts, if you have a 2×12 and you divide that by two, you don’t get two equal parts. Its like a 2×4 if you make a rip at 2inches you end up with one piece that is 2 inches and one piece that is inch and a half. Bisecting a 2×12 into 2 equal parts should — by definition — give you 2 equal parts. If you mean cutting a 2×12 @ 6″ then you’re right, because a 2×12 is not actually 12″ wide. This is a matter of semantics, not math. Just because it’s called a 2×12 doesn’t mean those are its precise dimensions. It’s a little annoying that it’s dimensions are not those in its name, but I think most folks who work with lumber are aware of this concept. This technique has been around for a long time, but Veritas does a nice job of simplifying these “tricks” with simple, relatively inexpensive tools. Sure, one could make a jig or tool that performs the same function, but who doesn’t like getting new stuff? And the Veritas line lets people get those new gizmos without breaking the bank. I’m not employed by Lee Valley, but I do like their stuff and I recommend them often. or Watch Ask this old house and see Tom Silva use these techniques all the time. Dressed or finished dimension lumber is called out by nominal size. Even with that there may be some variability on dimensions of a 2×12 depending upon the mill or lumber company – who may shave a bit here and there. To further confuse things – we sometimes work on old balloon framed houses that have “full dimension” lumber. Doing remodel work on these you either need to rip oversized lumber to the full dimension – or cheat by addinding some plywood. All that aside – if you physically divide a piece of lumber into sections (halves, thirds etc. by the method I described above – or by using he Veritas tool – you will get the correct result.